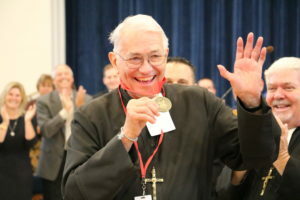 Over 1,000 Central Catholic High School students, faculty, staff, alumni, and friends witnessed Brother Rene D. Roy, FMS, a 1959 graduate of CCHS and former President of the school (2005-2009), being named President Emeritus during the Opening Mass at CCHS earlier this month. Br. Rene is the first person in Central Catholic history to be recognized with this title! The honor was presented to Br. Rene by current Central Catholic President Christopher F. Sullivan ‘81 in collaboration with Mr. Gino Baroni ‘74, chairperson of the board of directors for Central Catholic, former board chairperson Mr. Joseph Faro ‘87, and Br. Patrick McNamara, Provincial of the Marist Brothers in the USA. President Emeritus was bestowed upon Br. Rene as an honorary title for his distinguished service and continued support and guidance for the CCHS community as a whole. In addition to serving as president of CCHS, he was also vice president for mission effectiveness, and currently holds the role of campus minister for Central Catholic. Br. 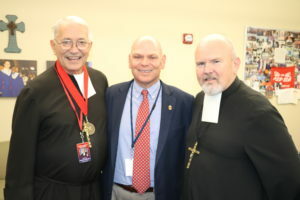 Rene has been a Marist Brother for 58 years, serving as a missionary in Rwanda and on the Pine Ridge Reservation in South Dakota, as the Marist Brothers Vocations Director, and as a principal and as a president at Marist high schools.